The Torpedo is a free play version of the Torpedo Competition table and suitable for home or office use. 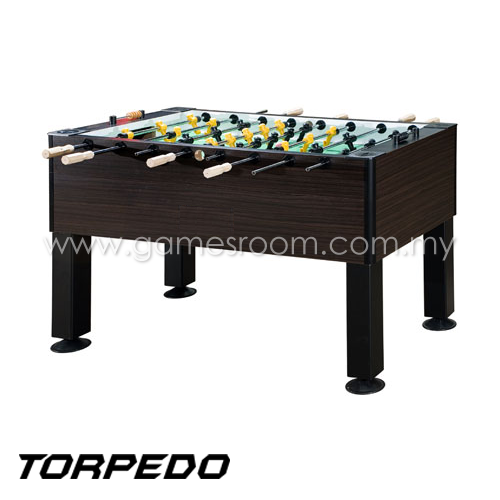 This table comes with leg leveler-wider contact area with anti-slip foam to improve table friction against the floor to provide excellent stability during game play. The leg is mounted steel with black powder coating and zink coated double-bolted legs for solid and long-lasting stability. The high pressure laminated surface provides durable and flat surface for the playfield. The Torpedo is supplied with 2 man goalie (13 players per team) and the handle is made with wooden material to provide better grip friction during game play. The rod is using nikel plated hollow steel rod to provide durable and light features during game play.